In a decision that likely saves oil company BP billions of dollars, a federal district judge has dismissed hundreds of claims for losses because the government shut down deepwater drilling after BP’s catastrophic 2010 well blowout. The decision, which U.S. District Judge Carl Barbier announced Thursday after the stock market closed, clears the largest remaining potential liability for BP from the massive Gulf oil spill. So far, BP has agreed or been ordered to pay more than $52 billion for cleanup, restoration, fines and compensation for the spill. The question still remaining was whether BP (BP) was liable for the government’s decision to block exploratory drilling after the spill and slow down permits to resume that activity. The moratorium not only blocked the drilling, but many of the support and supply services for deepwater drilling that are the lifeblood of many coastal Louisiana businesses. The Obama administration imposed a six-month moratorium on deepwater drilling in May 2010 — and lifted it after five months — because the April 20, 2010, explosion of the Deepwater Horizon rig raised major concerns about the safety of all oil and gas exploration in deep sections of the Gulf of Mexico. 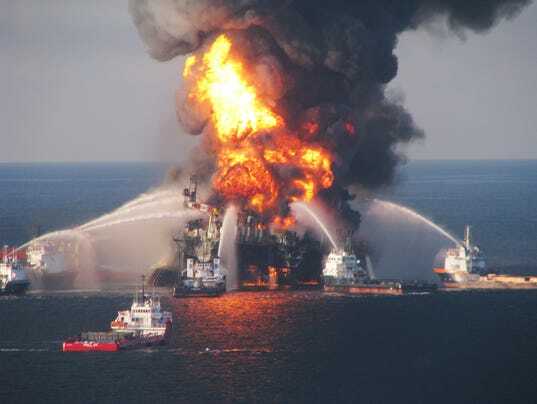 After hearing test cases in court, Barbier decided BP was not liable for losses during the moratorium under the Oil Pollution Act of 1990, the law that made the company liable and grossly negligent for the damage caused from its 87-day oil spill. BP stock rose a modest 2.4% during Friday trading, up 72 cents to close at $30.55. Most important to Barbier was the reasoning that the moratorium after the BP spill was different from other kinds of government shutdowns after oil spills, such as closing a river after a tanker crash. “There can be no doubt that the government would not have imposed the moratorium had the (BP well) blowout and oil spill not occurred,” he wrote in his decision. “However, the moratorium addressed the risk of possible future blowouts and oil spills from wells other than (BP’s) and was motivated by perceived weaknesses of industry-wide safety measures.” In other words, Barbier attributed the temporary shutdown to other, yet-to-happen incidents that would not be BP’s liability if any existed. BP spokesman Geoff Morrell declined comment Friday. Lead plaintiffs’ lawyers Steve Herman and Jim Roy were not available for comment.